You may have noticed we have been documenting Israel’s success in Germany and we may have mentioned to stay tuned for more updates on Israel in Europe. Well, the week of December 20th, IZ’ single “Over the Rainbow” was released in France and we are excited to announce that it also hit number 1! In more Europe news, the Single for “Over the Rainbow” was also released in the United Kingdom and is swiftly climbing the charts. 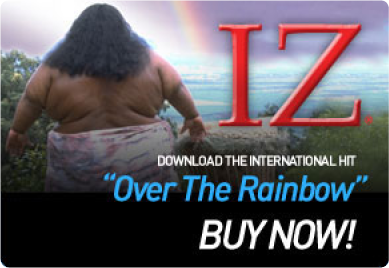 If you were watching the ball drop in Times Square in person or on TV this past New Years Eve, you may have noticed that once again New Yorkers celebrated this New Years with many songs, including IZ’s “Over the Rainbow”. Lastly, in our home country of the USA, our own Israel Kamakawiwo’ole was honored with the RIAA Platinum status for his single of (yup you guessed it), “Over the Rainbow” and Gold for his “Over the Rainbow/Wonderful World” Medley from his iconic album Alone in IZ World. Like most of IZ’s friends and Fans, we are completely humbled by the on going support of his music, Mahalo from everyone at Mountain Apple Company for supporting everything IZ. There are 2 comments on IZ hits #1 in France! Yep, here in France, we confirm the success !